How do I find a book about the post-Civil War American history? - Ask Us! Q. How do I find a book about the post-Civil War American history? 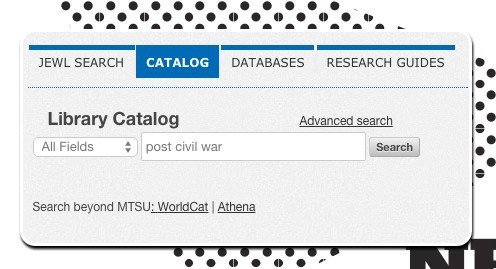 To locate a book on the "post-Civil War in American history", try searching the Library catalog. Type "post civil war" as a phrase or post civil war (which finds all the words but not necesarily next to each other). Search using All Fields Press Search to see your results. You may want to use the Narrow Your Search column on the left to select print books (At the libraries) or(Online) for ebooks.